Chaga is a rare and precious gift, par excellence. This superior medicinal food has been cherished and utilized by herbal foragers in Russia and China since ancient times. It is a powerful substance of the wilderness and is characterized by its blackened charcoal appearance on the outside and golden orange or burnt umber color on the inside. The energetic personality is oddly peculiar and magnetically charming. Once it makes an impression and leaves a stain on ones soul, one doesn’t soon forget it. Chaga is found in the boreal forests of the northern latitudes. It has a singular synergy with the birch tree and is remarkably beautiful, but discreetly camouflaged among the black and white tapestry. Finding it can be difficult because it tends to only be on about 1 in 100 birches in a given area and then these are outnumbered by the similar looking aspens. It takes patience and practice. The rewards are worth the effort. 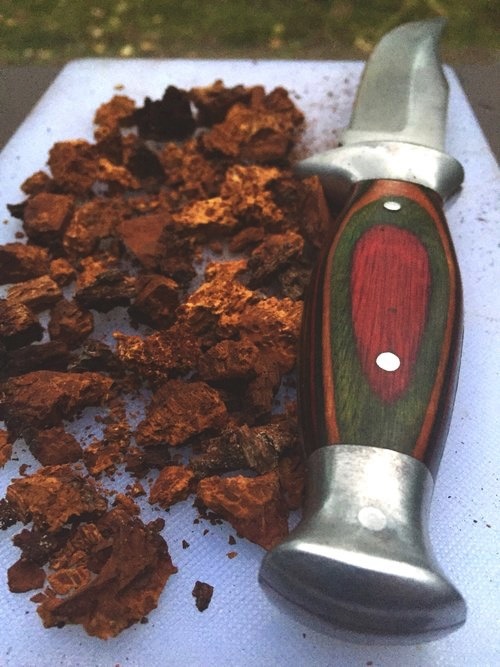 Once harvested and processed, Chaga will provide plenty of medicine in the form of tea or tincture. This can last a long time and be shared as a special gift. The price tag is usually fairly high and is often sold as a product to health stores. The best part for me is to simply go out into the forest and experience the wild elements and listen and feel more deeply. 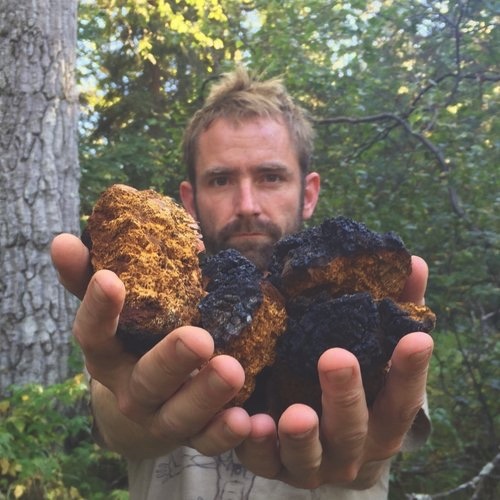 There are many things to learn from the nature of Chaga. I am humbly grateful for the opportunity to respond as a student to these species. I engage the art of foraging with ethical respect to the best of my abilities and am careful to only take a fraction of what I find and leave the rest intact for future flourishing. I believe it’s important to be kind and appreciative to the mushrooms, plants and animals that we collect, and kill. In the world we were born into, many of the ancestral life ways have been forgotten and we’re going to have to do our best to remember how to become better stewards of the lands and seas. 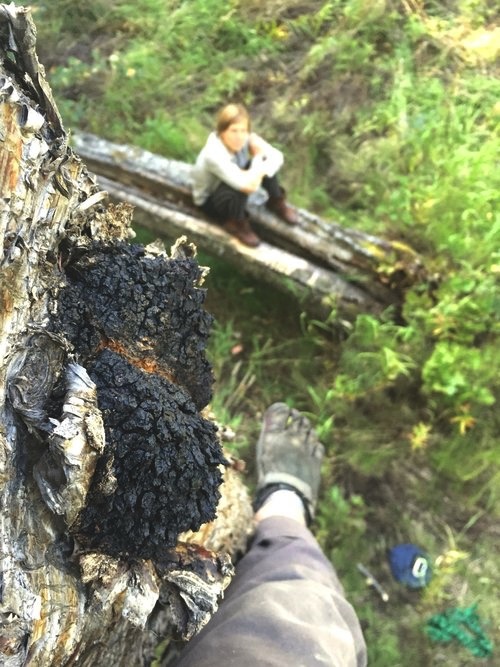 Chaga can be a great teacher to us. 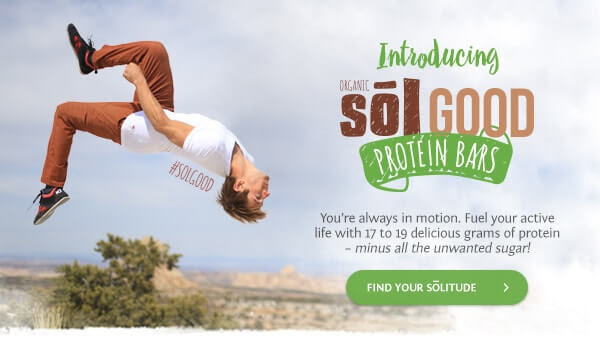 The following 6 paragraphs are specifically chosen from the book Chaga from David Wolfe who also wrote a few other world wide best sellers on the subject of health, nutrition and superfoods. These selected cuts are intended to distill the most potent information and impart the powerful essence of the message and meaning. 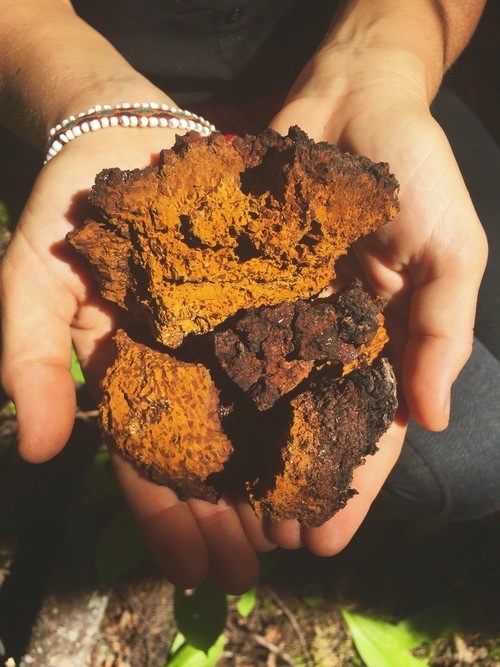 "Chaga is part of the order of mushrooms known as Hymenochaetales, the members of which can affect dead wood and living trees. Like the highly acclaimed medicinal Polyporales (reishi, Ganoderma spp., Fomitopsis spp., Grifola frondosa, Trametes versicolor, etc. ), some of the Hymenochaetales (notably chaga and Phellinus spp.) are considered to be members of a group of “medicinal mushrooms” because they have compounds that positively influence the immune system, joints, and nervous system of mammals, including humans." 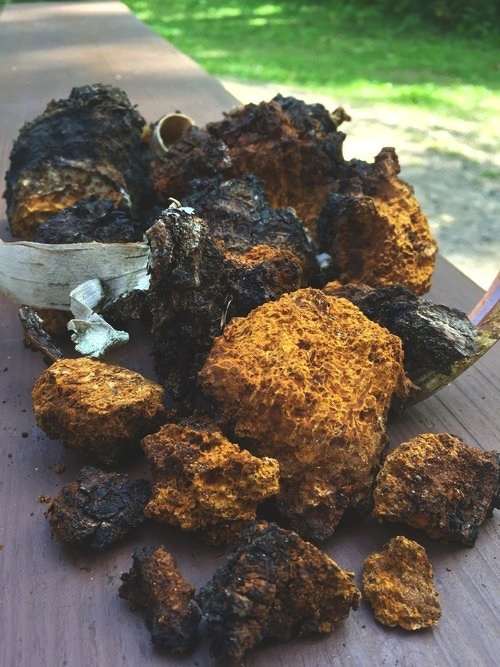 “Chaga tea and chaga mycelium are safe and important health-food products for all ages (1 to 101+ years of age) and all stages of life, including pregnancy. Barring rare tree-mushroom allergies, pregnant women can take chaga tea and chaga mycelium daily during their entire pregnancy. To date, no side effects or toxicity of chaga have been reported. Luckily for all of us, chaga has already been classified by the United States Food and Drug Administration as “food." 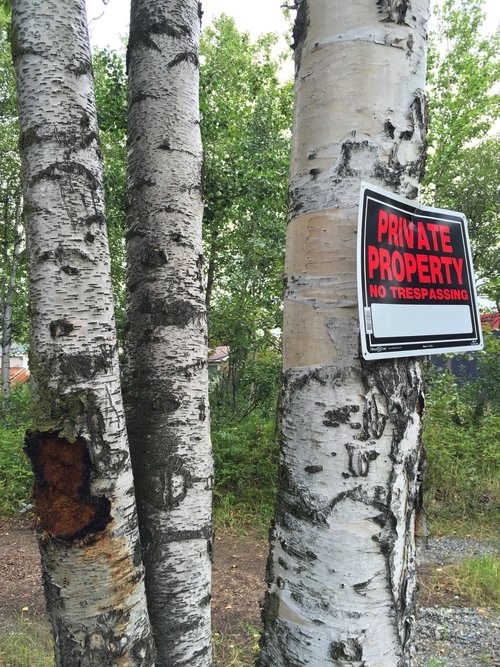 “The chaga and the birch take something they need from each other. In this model, chaga can even be seen as a protective force, because it improves the “immune system” of the host tree (as we have seen, that usually means a type of birch) and the forest itself. 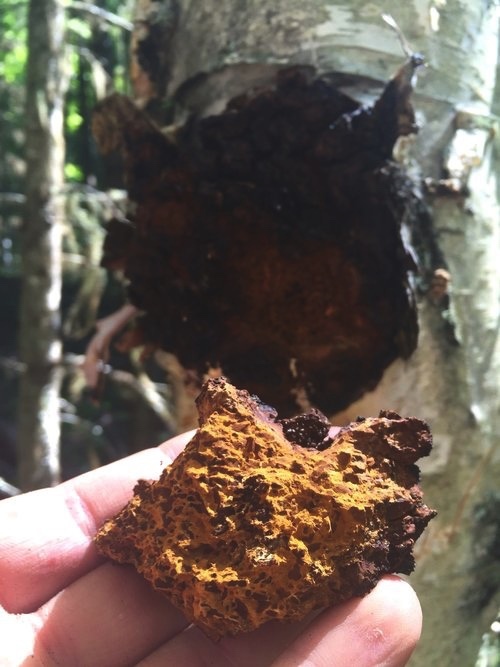 Research cited by Paul Stamets in Mycelium Running indicates that chaga extracts can be used topically against tree diseases (not just on birch trees), applied directly to the area of infection—further validating the symbiotic model of chaga. He details the story of a Quebec arborist who used chaga as a poultice to heal chestnut blight. 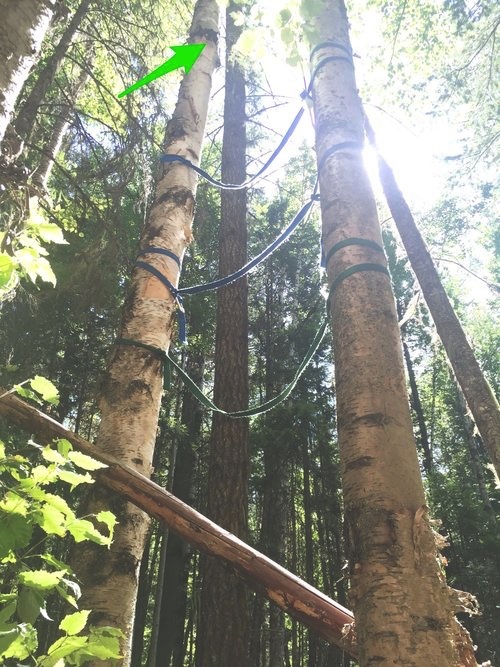 Not only did this save the tree from its immediate crisis, but the tree’s immune system was also permanently improved and became more resistant to future infections." Chaga was most notably introduced to the West by Russian writer Aleksandr Solzhenitsyn’s somewhat autobiographical novel The Cancer Ward. The book was initially published in the Soviet Union in 1968 and was immediately banned; its first English publication appeared in 1969. The Cancer Ward is the story of several cancer patients in the Soviet state of Uzbekistan in the year 1955. For the full photo set and more journal adventures, visit my VSCO page.